“Monuments Men” and “Saving Italy” How did Europe’s great works of art survive the destruction of World War II? Robert Edsel, author of “Monuments Men” and “Saving Italy” gives you the details and incredible story. I just download “Saving Italy” in audio format and can’t wait to get into it. 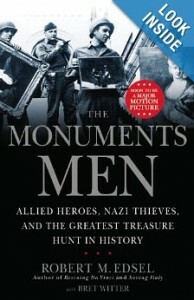 But right now, I’m listening to the precursor to this book which is “Monuments Men” which is due to come out in a movie with George Cloonie and Matt Damon this Sept. 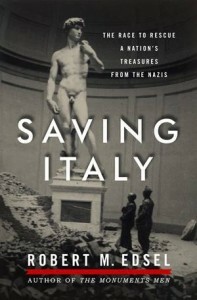 When the author was gathering info for his book, it became too massive and he couldn’t whiddle it down… so he published the very interesting details of saving Europe’s art during WWII in these two separate books. The books and audio are available on Amazon. Click on the book’s name for the link. This entry was posted in Research and Authentication and tagged Rescued from War. Bookmark the permalink. 4 Responses to “Monuments Men” and “Saving Italy” How did Europe’s great works of art survive the destruction of World War II? I loved the Monuments Men movie and I love the lesson you pulled from it to be applied to us all. You’ve made a logical and important distinction! The movie was great but I appreciate your lesson to be learned from their efforts that we can/should remember.